Hello all! Look what I found for this Monday's Krazy Klassy Kitchen! I love the bright, white color which seems to make the kitchen area so light and clean looking. I really love the wood floor in this kitchen. I do love the stove as well. It's very nice. Most of the time I do not care for kitchen islands, but this one seems to not block off the kitchen and works well in it's location. One issue I have is there does not seem to be much counter space, or storage space. 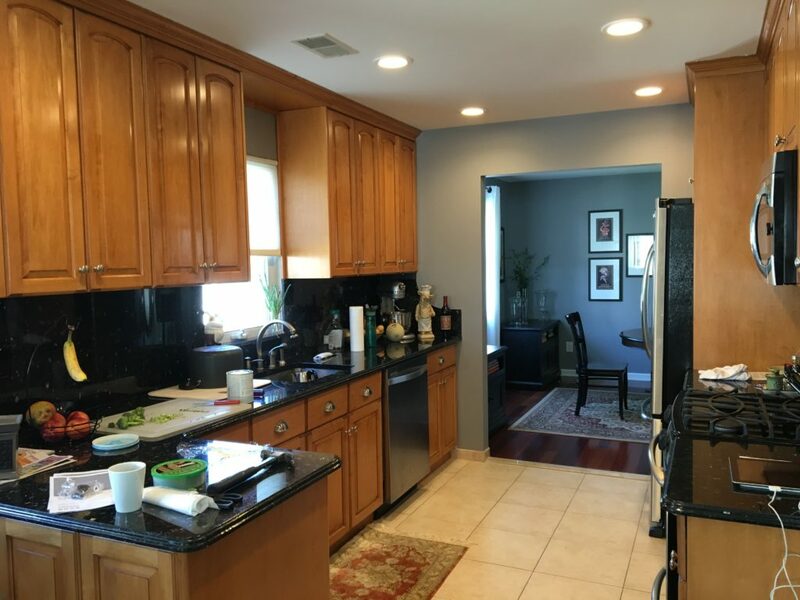 Having dealt with many kitchens that did not have enough counter space, it is a big issue with me. Even though there is the island, I still prefer to have counter space over that. Happy Friday everyone! Here we have the funny winner for this week's posting. The made me snort out loud when I saw it. Hope it brings you a smile as well! How funny! 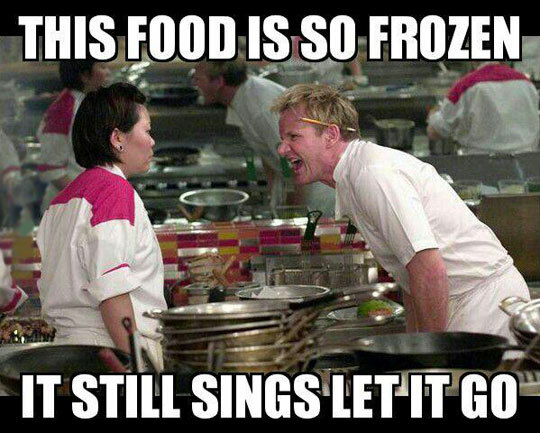 And how many of you suddenly began singing the song in your head or out loud when you read this? I know I did, and I don't have any children living at home! So let's here it, who gets a song stuck in their head and it drives them crazy? I'm raising my hand. Have a blessed Friday all! I found this great set of top cleaning tips & tricks for the kitchen. A few of them I had heard of before, but several of them I had not. Great bit of information. Take a look and see what you think. All of these tips are valuable and certainly doable. I especially liked the last one in the video. I had never thought of that before, and it's a great idea. As for the sponge tip, that is so dead on. I cannot stand seeing sponges older than I am hanging around in a kitchen. Take a peak, see what you think. Let me know! Wow! Have I found a kitchen for us this week! This kitchen's U-shaped design boasts helping high efficiency in the kitchen. This kitchen has a high ceiling as well as some interesting lighting. I love the rich warm colors of this kitchen. The stove and the back-splash area are phenomenal! Such a gorgeous design and the range hood is hid beautifully in an elegant cabinet The floor is beautiful color of wood which goes excellently with the cabinets. I do not like the light hanging over the island, it would something that would certainly have to be kept dusted. I know I've said it before, but I'm not a big fan of kitchen islands. This one, while I'm sure it is functional, seems to be in the way. With all the counter room, I don't think the island is really necessary. Ahhh this is a joke my dad would tell. Too cute! It's Friday folks, enjoy the funny!! This reminds me of watching the movie Stripes and the "Aunt Jemima Treatment" provided by Bill Murray. If you haven't seen the movie, you need to look it up. It's like me, an oldie but a goodie! Everyone have a great safe Friday and I'll see you on Monday for my next Krazy Klassy Kitchen! Here are 10 tips for the kitchen and they truly are incredibly useful! I really liked #1 with the instructions on how to properly cut. I do tend to cut myself, so this tip was awesome! Most of these tips are truly great information. All of the tips were helpful and very informative. I loved the one concerning the red pepper. I have tried most of these tips and they are great. There is nothing better than fresh sweet pineapple! Let me know what you think! Well I've found another interesting kitchen for us this Monday! I absolutely love the openness and comfort that this kitchen brings. There seems to be a very nice amount of storage space as well. I love that the table/work area has the wine rack as the leg. How unusual and great is that? There is plenty of lighting and gorgeous cabinets. 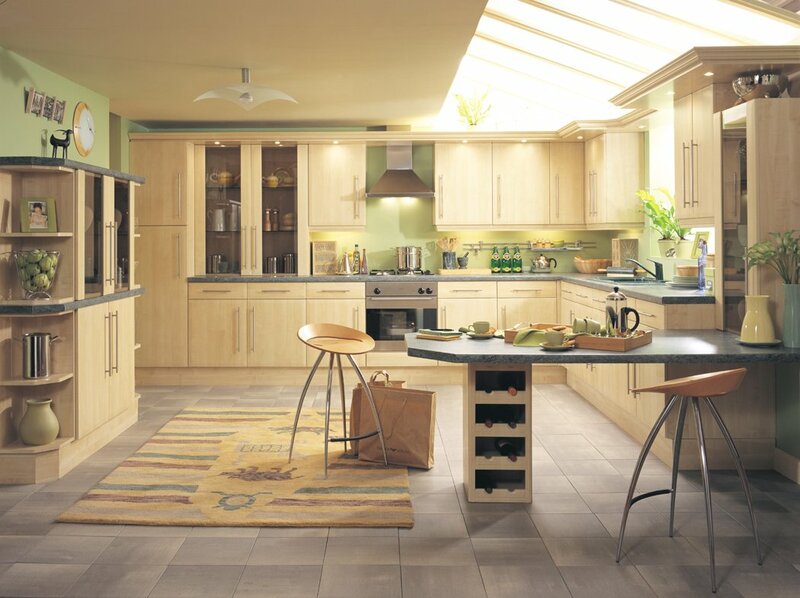 The Karndean floor tile accents the light natural colors of the kitchen. I do not really care for the range or the hood area of the kitchen. It looks rather out of place to me and perhaps would have worked better closer to the sink area. I am not sure what the storage unit is against the wall with the clock. It could be just storage or decorative. The wood matches the kitchen area, but it seems to be just another area to catch dust and clutter. Hey all, it's Friday. 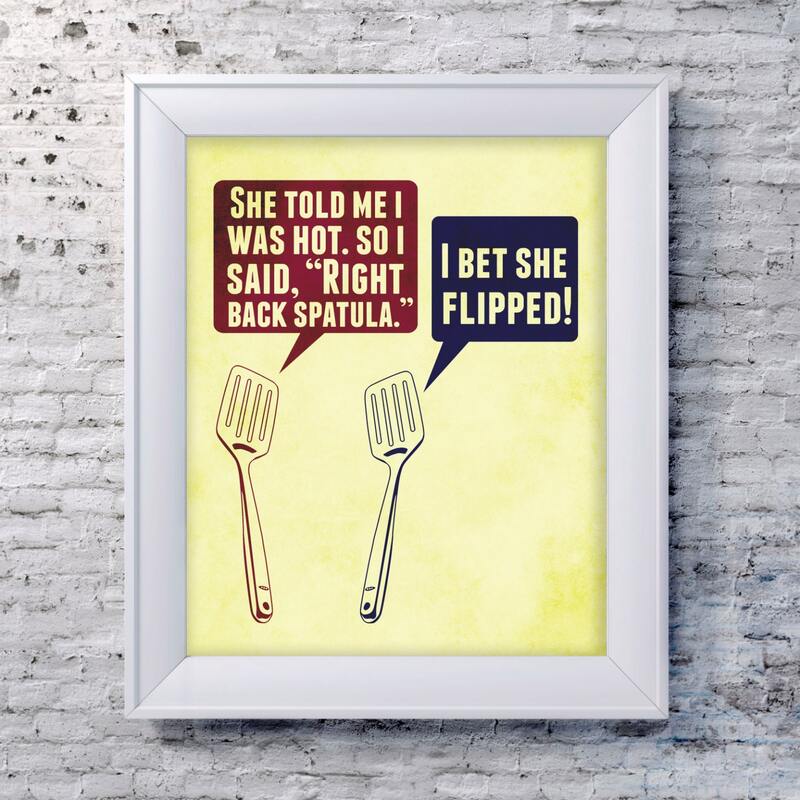 Here is our Friday Funny for the week! 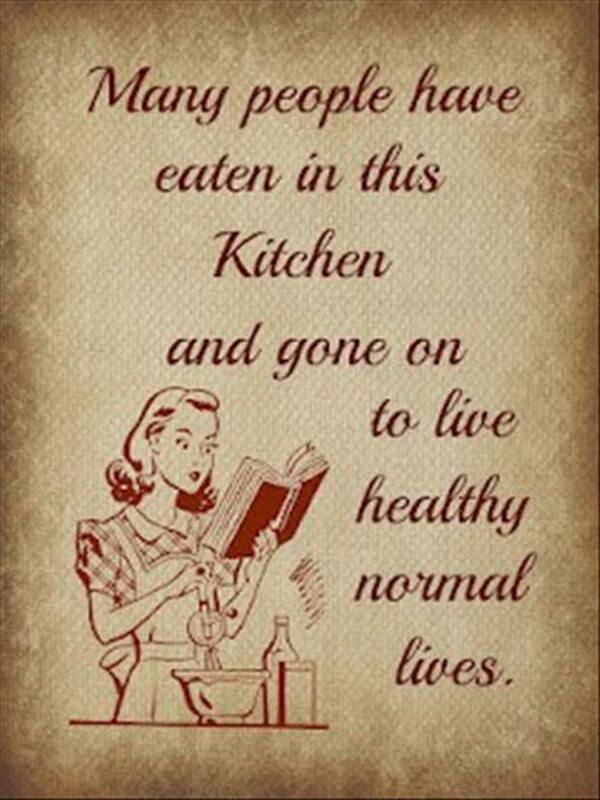 I really could have used this posted in my kitchen when my children were growing up. I certainly hope I was not the only mom whose children just knew the "new dish" would make them very sick. They really should not have complained, I never made them liver like my mom made for us to have. Did any of you all have grumpy eaters at home? Here are 5 fun kitchen gadgets for the kitchen. Number 5 is great, I can't wait to try it this summer! Most of the gadgets were great, but number two did not impress me at all. I really enjoyed the rest of the gadgets. Number three was really inventive as well. Take a look, see what you think. I often hear that people feel that "children are not as responsible as we were in our youth", "they do not have manners", so on and so forth. Society has changed of that there is no argument, however, people still do good things for the right reasons, people still show compassion and kindness. It does the heart good to see that many children ARE responsible and have been taught to give back to the world they live in. 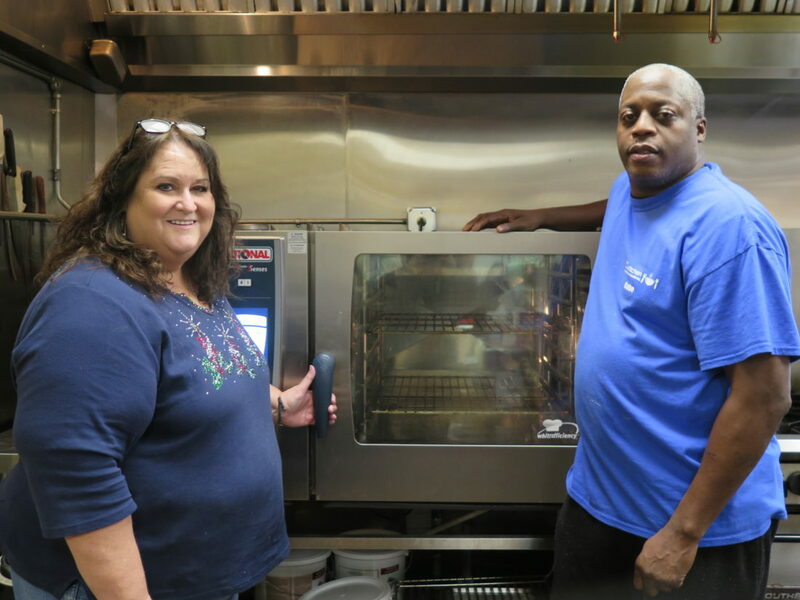 The Wheeling Soup Kitchen discusses that they need help all throughout the year as well as the holidays, and that children are welcome to come serve and help. If you would like to read this article yourself, you can read it here. We have found a marvelous kitchen for you this Monday. It offers beautiful granite counter-tops and an island complete with it's own sink. This kitchen also offers gorgeous wood flooring. The glass kitchen cabinet doors are very nice and go well with the windows in the kitchen. The stove looks to be perfect for family cooking. The style of the kitchen is very warm and comforting. I like the pantries on either side of the section where the stove is located. Nice touch! One item which I really did not care for was the range hood. It seems to take away from the kitchen cupboards and does not appeal to me. I do not really like the island, as I am not a big fan. It does provide more work space, but because of the distance between work areas it does not seem to flow well.